Every boy needs a birthday dinner, none more so than my other half, Jarod (he of the cauliflower cheese). He deserves a reward for putting up with me for so long and this year we decided to throw a dinner party to celebrate him edging a step closer to 50. Cooking for large numbers can be a real pain, especially when you’ve got an oven for four people with a changeable attitude to temperature and you’ve had a skinful while preparing the food. This dish is simple to prepare, simple to cook (you do need to check that the fish is cooked all the way through when cooking in bulk) and simple to present. The wow factor here comes from the presentation (see the last pic below). I’m lucky enough to have an extra long board – if you don’t, then buy a 3ft piece of wood to serve from. Serving this individually lacks the punch of serving it as a centre piece (for Jarod I got the oohs and aaahs I was hoping for). I’ve chosen tarragon for this but basil works well too. Another combo is swap the tarragon and lemon for Thyme and bitter orange. Mix butter, herbs, juice, zest and pepper till well combined. Score each fish on one side (three times should do it). Rub the butter into each of the scores on the fish and add a knob into each cavity. Arrange head to tail in your dish and cook for 20 – 30 mins (this really does depend on your oven – I’ve had to vary cooking times in different locations). Once cooked, arrange your fish on your board diagonally head to tail. Serve with Pol Roger… and plenty of it, it’s a birthday after all. My colleague Jo, in Dubai, made this and sent the picture through. I love how she’s presented the fish and has given me ideas for when I don’t have that big board to hand… Thanks for sharing Jo! Jo’s bream, beautifully presented, nose to tail. 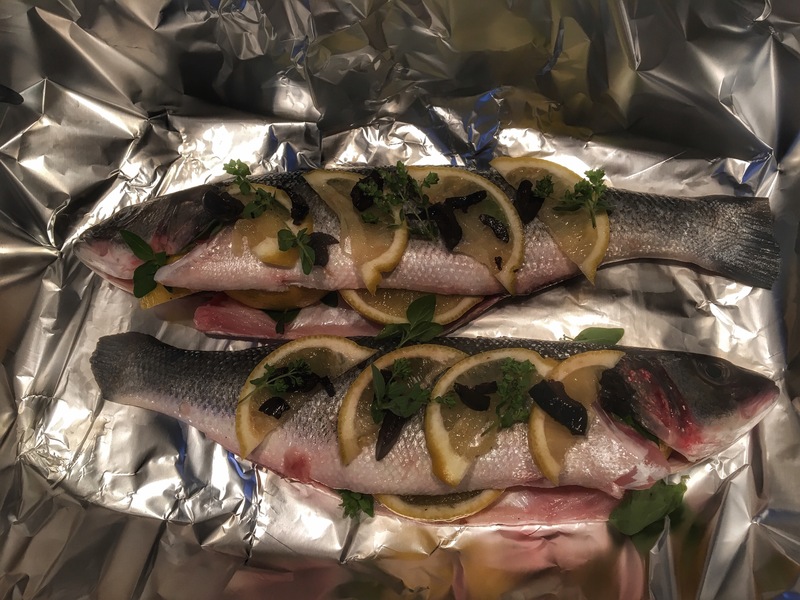 And an alternative is sea bass stuffed and topped with chopped black olives, fresh oregano and sliced lemon.